Are you a first time buyer or even an existing home owner looking to make improvements to your home? If you are and would like to find out more about our home improvement service, or would like a quote, please contact us and we will be in touch with you very shortly to discuss your requirements. Refurbishing your property whether it be a private or commercial building will considerably increase not only the comfort but will also add value to the property. 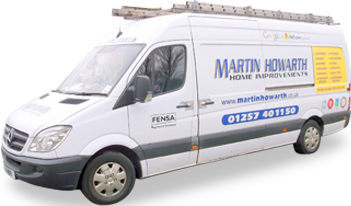 Martin Howarth Home Improvements has many years of experience undertaking private homes, shops and office refurbishments. Martin Howarth Home Improvements offer a fitting service for all styles of windows and doors, including timber; aluminium and uPVC. We are also able to replace misted units. For a free no obligation quote please get in touch today and we will be in touch with you very shortly to discuss your requirements. Decking is one of the most useful home improvements that can be made. Timber decks add beauty and value to your home and offer the perfect way to expand your living space into the outdoors. We offer a service were we put your ideas to practise, from small to large areas. Martin Howarth Home Improvements is a small but well established home improvement company based in Wigan, Lancashire. Specialising in all aspects of property improvement – starting with minor repairs to complete property renovation projects, shop / office refurbishments as well as loft conversions and house extensions. Having experience as specialists in many building or refurbishment projects for 36 years. Our vision is to bring your thoughts to reality, so we are prepared to go that extra mile to meet anyone’s expectations. Martin Howarth Home Improvements are also available for odd projects. So if what you’re interested in isn’t listed opposite please just give us a call to arrange a visit and we will be more than happy to come and give you a free no obligation quote. Martin Howarth Home Improvements are available for work in the following areas – Wigan, Chorley, Preston, Manchester, Liverpool and throughout the UK. Drone Photography & Filming NEW! Once more highly delighted by service provided. Work completed to the highest standard. No hesitation in recommending this builder. Excellent customer service,always turned up at agreed time. Carried out the work effectively and efficiently. Good workmanship and very professional. Would hire again to do further work. Excellent team! Perfect job. Will always use Martin in the future. Well Recommended. The work carried out by Martin is always excellent. He is very honest and takes pride in his work. He acts as project manager pulling all other contractors together. He is not satisfied until the work is completed to a very high standard and I would not consider using any other contractor. Martin has done quite a lot of work for me over the years and always provides a first class service. Took a bit to get Martin booked in as he was very busy, but chose to wait based on the existing feedback from this site. The work was carried out quickly and to a great standard. Martin arrived on time and even had a look at a couple of extra items for me while he was here. Would happily recommend Martin to anyone and will most certainly look him up again when I need more work doing. I have used this company for a variety of work from fitting bedrooms and kitchen to small maintenance jobs. All work carried out has been to an excellent standard. My latest was the plastic shed that has been erected – very good! They also clean up at the end of the day. No hesitation in recommending Martin. Copyright © 2014 Martin Howarth Home Improvements. All Rights Reserved.